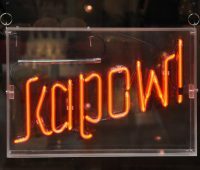 The original Kapow Coffee is a small spot, tucked away on The Calls in Leeds. This, the second branch, which opened in April 2017, is a much larger affair, although initially it seems not much bigger than the original. 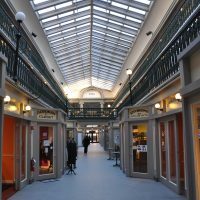 Located in the magnificent Thornton’s Arcade, one of Leeds’ many fine examples of Victorian architecture, it occupies a narrow store, spread over three storeys, with a smattering of seating on each floor. The extra space has allowed Kapow to expand its coffee offering compared to the original, where there’s just a single espresso blend on offer. Here, the Revelation blend from Union Hand-roasted is a permanent feature, joined a regularly-rotating guest espresso. There’s a selection of single-origin coffees available via the V60, while there’s an even larger selection of retail bags and, if you ask nicely, the staff will make you a pour-over of any of these. While I was there, local roasters Maude Coffee and North Star were well-presented, with Maude’s Parallel making an appearance as the guest espresso. If you are hungry, there’s a selection of cakes and sandwiches displayed on the counter, while if coffee’s not your thing, there’s hot chocolate and tea from Bristol’s Canton Tea Co.
New Harvest Coffee & Spirits is that relatively rare combination in America: a coffee shop and bar, serving coffee by day and whisky and other spirits by night (although I believe you can order anything anytime). That it’s also a long-standing roaster (as New Harvest Coffee in Pawtucket, Rhode Island) and is housed in America’s old shopping mall, the Arcade Providence, makes it something very special indeed. Although New Harvest Coffee has been roasting since 2001, the coffee shop only opened in 2014. 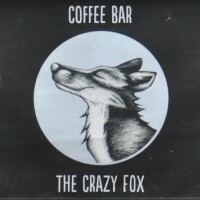 There’s a seasonal house-blend and decaf on espresso, two options on bulk-brew and one on pour-over (Kalita Wave), backed up by a selection of cake and a wide range of spirits and cocktails. New Harvest Coffee roasts 8-10 single-origins at any one time, giving it plenty of options in the coffee shop. There’s a light-roast on bulk-brew, which is usually a single-origin (which changes every day or so) and a dark roast (which changes less frequently). This tends to be a one of two filter-blends, but during my visit it was a single-origin from Papua New Guinea, while the light-roast was a Kenya from Kiangothe. Finally, the pour-over option is another single-origin (an Indonesian during my visit). Faculty is now an old hand in Birmingham’s booming speciality coffee scene, having opened at the start of 2014. Located at the southern end of the beautiful Piccadilly Arcade, it’s right outside the New Street entrance of Birmingham’s New Street station and literally just around the corner from the new Yorks Café & Coffee Roasters. 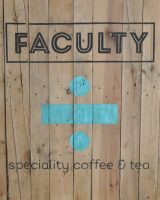 Faculty’s a true multi-roaster, offering a single-origin on espresso and two more on V60, plus there’s a decaf option. If you don’t like the roaster/options, come back next week and the chances are they will have changed. There are cakes from Sixteen Kitchen, which occupies the unit next to Faculty, from where it serves breakfast, lunch and sandwiches in an interesting space-sharing operation. 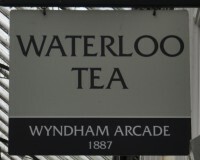 Wyndham Tea is the third of Cardiff’s well-respected Waterloo Tea chain. Most unexpectedly for the Coffee Spot, I’ve actually visited them all in the order that they opened, starting with the original out in Pen Y Lan and continuing with Washington Tea in Penarth. Wyndham Tea is Waterloo Tea’s first foray into the city centre and, pleasing enough, is on the Wyndham Arcade, one arcade down from Uncommon Ground and two down from The Plan. What you get with Wyndham Tea is everything you’ve come to expect from Waterloo Tea: a fantastic range of over 60 excellent loose-leaf teas, superb coffee (espresso and pour-over) from an ever-changing cast of roasters, fabulous food, all prepared on-site and a range of delicious cakes (now all baked on-site in the kitchen upstairs). All of this is in Waterloo Tea’s classiest setting yet, spread over two floors and spilling out into the arcade itself, where the pink and gold sofas make it hard to miss. Best of all is that Waterloo Tea has now moved to full table service, reinforcing its notion of a “slow setting”, somewhere where you’re encourage to sit and linger; comfort, with a touch of class. Uncommon Ground Coffee Roastery is in Cardiff’s Royal Arcade. Dating from 1858, it’s the city’s oldest arcade and is one down from the Morgan Arcade, home of the venerable The Plan, Cardiff’s original speciality-café-in-an-arcade. Mind you, it seems that every arcade has a coffee or tea shop these days. Perhaps the Welsh Assembly passed a new law. Or maybe people have realised that lovely Victorian Arcades deserve lovely coffee shops… Either way, the arcade makes an excellent setting for Uncommon Ground. Don’t be put off by the name, by the way. Uncommon Ground’s a lovely coffee shop, its interior and layout doing full justice to its elegant surroundings. There is a roaster, or there was when I was there, the original plan being to roast in the back of the store. However, problems with the gas supply led Uncommon Ground to relocate the roasting off-site. With luck, the new roastery should be up and running next month. Until then, the coffee is being roasted by North Star in Leeds. There’s a bespoke espresso blend, plus a couple of single-origins through the V60. If you’re hungry, there’s a good selection of cake and a small selection of sandwiches, Panini and wraps. 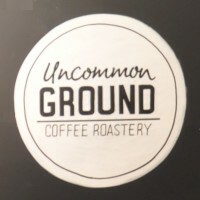 August 2017: It took Uncommon Ground a little while longer than expected to get the roastery up and running, but I’m pleased to report that as of April this year, Uncommon Ground is roasting a house-blend on espresso, plus two single-origins on filter, with plans for more to come. I tried the Latumba from the Democratic Republic of the Congo as a V60 and it was excellent. Yorks Espresso Bar is a new addition to Birmingham’s growing Yorks chain, which started with Yorks Bakery Cafe on nearby Newhall Street. 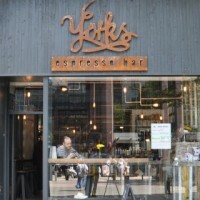 Technically the espresso bar is now the longest serving branch of Yorks, since Newhall Street closed at the end of 2015, the building undergoing a major refurbishment. This led to the mantel of Yorks Bakery Cafe being taken up by the new flagship cafe/roastery on Stephenson Street. Regular readers know my love of Coffee Spots in Victorian Arcades, so it’ll be no surprise that I fell in love with the Espresso Bar the moment I saw it. Occupying a corner spot at the Colmore Row end of the Great Western Arcade, which joins Colmore Row with Temple Row (once home of the comparatively venerable, but now closed, 6/8 Kafé), it’s an amazing location. Spread over a compact, elegant ground-floor and a stripped-back, cosy mezzanine, it gives Faculty a run for its money as Birmingham’s most beautifully-situated (and beautiful) coffee shop. Smaller than the Bakery Cafe, sacrifices have had to be made. The extensive menu and freshly-cooked food has been replaced by a small range of (equally freshly-made) sandwiches and cake. However, there’s no compromise when it comes to coffee, meaning the “espresso bar” tag’s a bit misleading, Yorks offering an extensive range from Caravan, including three pour-overs, two espressos and decaf. Opposite is a chain of three coffee shops in Leeds. The original Opposite (opposite Leeds University, hence the name) is 10 years old, while the third, out in Chapel Allerton, opened just over a year ago. This, the second Opposite, opened five years ago, under the soaring stained-glass arcades of the Victoria Quarter shopping centre in the heart of Leeds. The Victoria Quarter branch is an interesting hybrid. It’s a kiosk, and feels like it should be a takeaway spot, but it’s got seating. However, despite the soaring glass ceiling, it’s not exactly the same as sitting inside, which I discovered on a freezing day in February where it was about as a warm as sitting out on the street… That said, it is an absolutely magnificent setting and well worth visiting. Just remember to wrap up warm. Or go in the summer. January 2017: Sadly I have learnt that Opposite’s Victoria Quarter branch has had to close. It will be sadly missed. On Bath’s High Street, just a few steps from the Cathedral, opposite the Guildhall and with High Street chains Caffé Nero and Patisserie Valerie to one side, Starbucks to the other, this is an unlikely, but welcome, location for an independent speciality coffee shop. 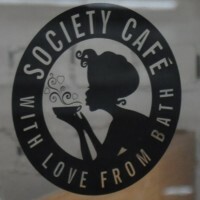 This prime spot, at the eastern end of the Corridor, Bath’s Georgian shopping arcade, is home to the second of Bath’s two branches of Society Café. It’s a wonderful location, probably the loveliest setting out of all the coffee spots that I’ve visited in Bath. During my visit, most of the coffee was from locals, Round Hill Roastery, with two single-origin espressos (Round Hill’s house single-origin Guatemalan, plus a guest) and two single-origin filters, one through the Aeropress, the other through the Clever Dripper. There was also a guest filter, a single-origin Kenyan from Workshop, while Society Café regularly rotates all the coffees, including the house espresso (which is always from Round Hill) and the guests. If you don’t fancy coffee, there’s always a selection of loose-leaf tea and hot chocolate from old friends Kokoa Collection, as well as Willie’s Cacao. Add to that sandwiches and a great selection of cakes and you’re spoilt for choice! August 2017: I’ve learnt that Society Café has switched its house roaster to Origin, although Round Hill still features regularly as a guest.